Induction Cooker is a household instrument, where metallic cookware is heated by Induction Heating system, the metal and resistance leads to Joule heating. A common misconception is, Induction Cooker is a kind of Microwave Oven. Here is insight on both Induction Cooker and Induction Heating. Energy in the form of an alternating electromagnetic field applied to the bottom of the cooking vessel where it is converted into heat. From below the glass ceramic cooking surface is an current-carrying coil on which a magnetic alternating field is generated. This induced on a metallic cup/ utensil placed over it, by induction eddy currents is generated which heat the metallic bottom of the pot by ohmic resistance. The common frequency lies in the range of about 20 to 50 kHz. Demonstration of Induction Cooker was shown by General Motors in the mid-1950s, but the primitive Induction Cooker dates back to 1909. Although induction heating works in principle with all metal, to achieve a high efficiency with a standard induction cooker, a vessel with a base made of ferromagnetic material is recommended. Induction Cooker has a good efficiency of the conversion of electromagnetic energy to heat. This is mostly the case in iron alloys. Induction cooker compatible cookware meets these conditions and usually an icon of a square wire coil is seen on the pot or pan. This symbol has no functional warranty. Thicker bottom are beneficial for better heat distribution. Most Induction Cooker switch the excitation field off automatically when there is no, too small vessel or if no pan is on Induction Cooker. However, the electronics can be fooled by a lying metallic object on it, which it regarded as a pot. 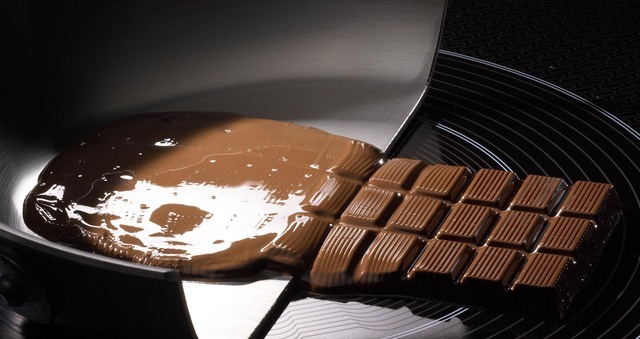 Image : The chocolate melted only where the metal is present. Usage and norms of using Induction Cooker standard varies from country to country. In US, India and some European countries usually comes as with 4 induction cooktops and ceramic glass surface. However, for low end usage or for the need of alternative cooking option (like in India where open flame is required for cooking), Induction Cooker is synonymous to only one cooktop. Induction heating is the process of heating an electrically conducting object by electromagnetic induction, where eddy currents are generated within the metal and the resistance leads to Joule heating of the metal. An induction heater consists of an electromagnet, through which a high-frequency alternating current (AC) is passed. Heat may also be generated by magnetic hysteresis losses in materials that have significant relative permeability. The frequency of AC used depends on the object size, material type, coupling and the penetration depth. Induction Cooker is safer than Microwave Ovens when compared for the potential unknown or remote health hazards. If we think of the color spectrum, in case open flame, the Violet extreme of (VIBGYOR) and above (invisible) electromagnetic waves are probably become gradually dangerous. The case of Induction Cooker is different though. This Article Has Been Shared 1691 Times! Cite this article as: Abhishek Ghosh, "Induction Cooker and Induction Heating," in The Customize Windows, January 6, 2013, April 19, 2019, https://thecustomizewindows.com/2013/01/induction-cooker-and-induction-heating/.